Onion sets and seed potatoes arrive mid-January at J&N Feed and Seed. Planting potatoes and onions are at the top of everyone’s gardening list this time of year. As everyone in North Texas knows, our late January and February weather can be a gamble— temps can be spring-like one day and fall below freezing the next. But, the weather extremes should not deter gardeners from planting during these months. Potatoes are top of the list for planting this time of year. Other good go-to cold weather vegetables are root produce such as turnips, beets, and carrots as well as hardy leafy greens like spinach, cabbage, kale, and chard. Bulb veggies (onions and garlic), as well as asparagus crowns, can also be planted at this time. When purchasing seed potatoes, look for certified seed potatoes. These are seeding potatoes which have not been treated with growth retardants to prevent sprouting. Conventional potatoes in grocery markets are typically treated with retardants. Potatoes need consistent moisture, so water regularly when tubers start to form. Before the potato plants bloom, hilling should be done when the plant is about 6 inches tall. Hoe the dirt up around the base of the plant in order to cover the root as well as to support the plant. Bury the plant base in loose soil. Hilling will keep the potato plants from getting sunburned, in which case they turn green and will taste bitter. 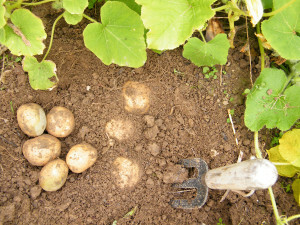 You will need to hill potatoes every couple of weeks to protect your crop. When the potato plants have bloomed, new potatoes are ready for harvest. For larger potatoes, harvest only after plant tops have fallen over. For more information on planting seed potatoes, visit the Texas A&M website. Lettuce, spinach, and cabbage can be planted at this time either by seeds or plant starts. For reference, these vegetables can be planted in February with seed or starter plants. Stop by J&N for your seed potatoes, onion sets, and other cool weather vegetables. This entry was posted on Saturday, December 29th, 2018 at 7:44 am	and is filed under News & Updates. You can follow any responses to this entry through the RSS 2.0 feed. Both comments and pings are currently closed.